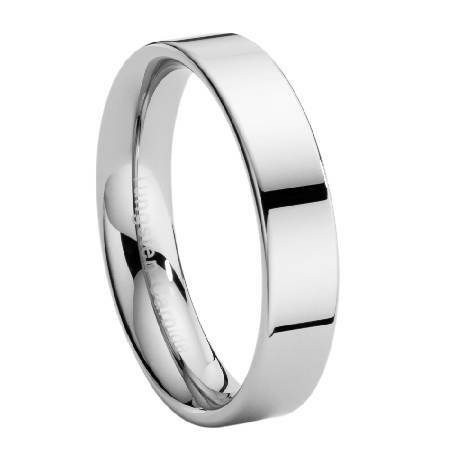 This Tungsten carbide wedding band features a comfort-fit with a high polish flat profile. A simple, yet elegant design. Comfort fit tungsten rings usually run 1/2 size larger, it is suggested you buy a half size smaller than your standard ring size. We recommend having your finger measured for a comfort fit ring at your local jewelry store for an accurate fit. All of our tungsten rings come with a lifetime warranty. This ring is awesome quality and very comfortable. It took some time to get the correct size, all my fault, and their customer service was excellent. They went above and beyond to make sure I was satisfied. Very happy with the ring. Comfortable to wear and looks great!